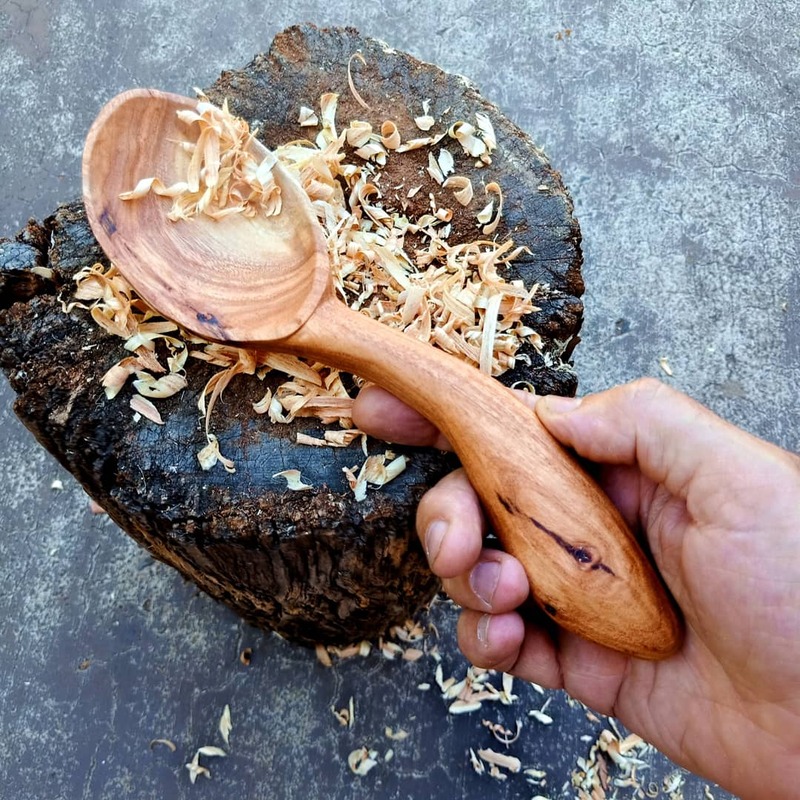 Made from locally sourced Melaleuca, this generously sized dry goods scoop features attractive grain and a bonus feature knot. The finish is farmhouse and retains evidence of the knife marks from its hand crafted manufacture. Finished with ‘spoon butter’ a mix of raw linseed oil and natural beeswax this scoop it perfect for use with any dry material: flour, beans, rice, pulses etc. These four cooking spoons were hand-made from the same half of a piece of black wattle. Featuring prominent grain, they will be a delight to use for a range of cooking needs. They are numbered in the image – sold separately or select which combo’s you’d like, or all four. Length averages 240mm. Handles can be shortened on request or hanging hole drilled. Finished with food safe raw linseed oil. Price: $20 each plus post $10 flat rate or local pickup Toowoomba. 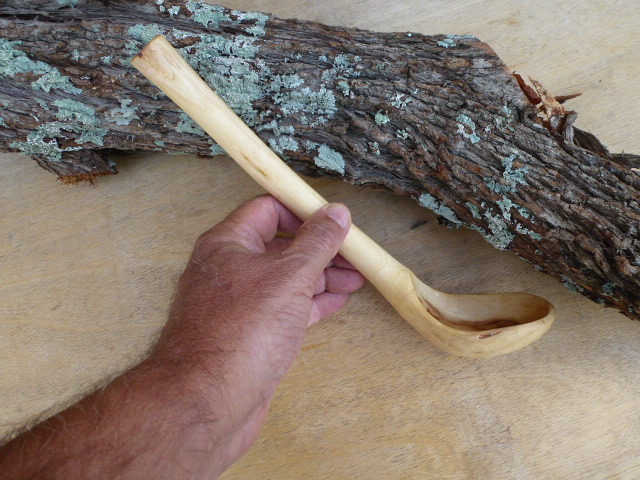 When hand making wooden spoons, sometimes a knot or other aspect of a piece of wood requires a deviation. This was the case with this piece of Melaleuca Amarilis. The bend handle is surprisingly ideal when combined with the strongly offset spoon bowl. For sale – $30 – free local pickup or $10 post Australia wide, $20 international. 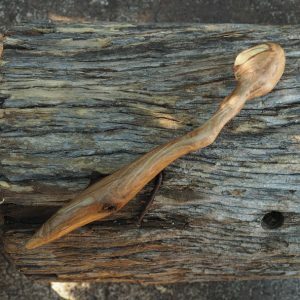 Featuring a fun shape following the natural grain of acacia timer, this spoon has nice contrast between the darker heartwood and the lighter sapwood. 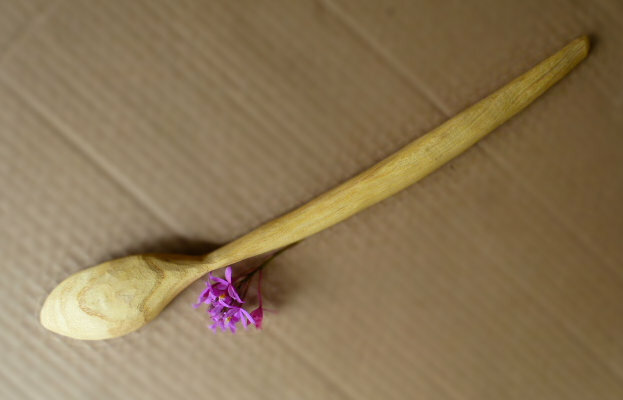 Ideal for stirring and other cooking tasks, it would be a great addition to any kitchen, especially those who like the rustic and hand-made look. Featuring sweeping lines this elegant white wood kitchen cooking spoon is ideal for cooking or serving small quantities. 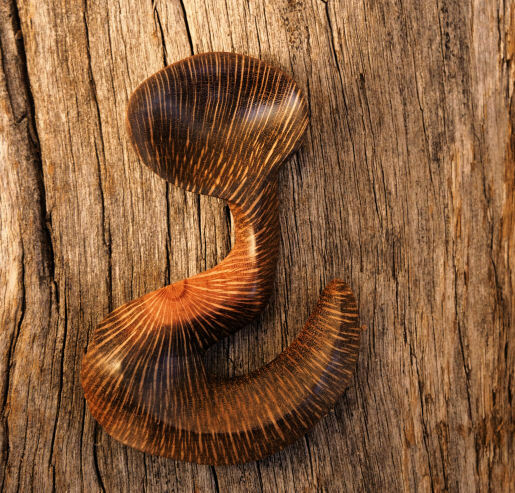 Made from privet wood, often known as a garden plant or invasive plant, the timber is durable yet light in weight. 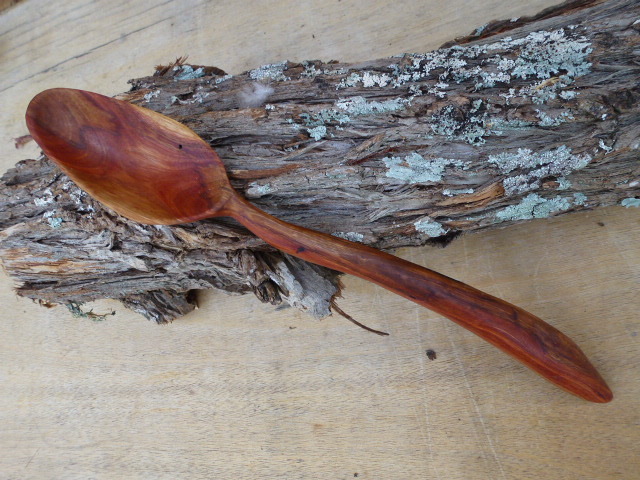 Featuring a natural knife finish and having several coats of food-safe linseed oil. 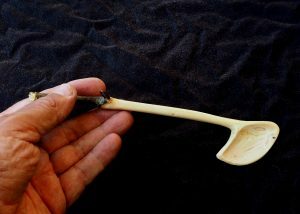 This spoon is 315mm long – bowl 75x60mm. 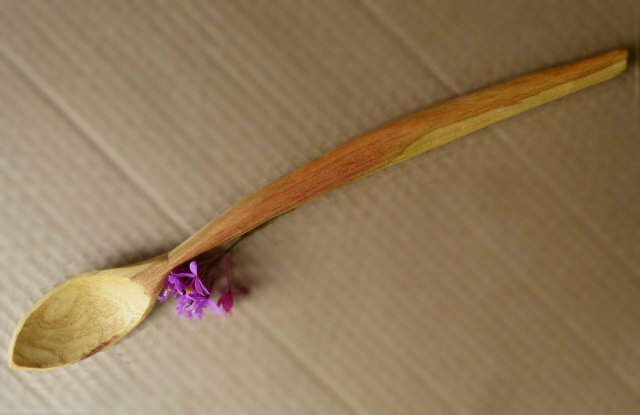 This fabulous Acacia wood ladle has been handcrafted from the trunk and branch of a locally-grown Wattle. Three trees were cut on the day, so not sure of which species this one is. The handle has a quirky curve and is best suited to left-handers and great for serving stews, soups or rice. 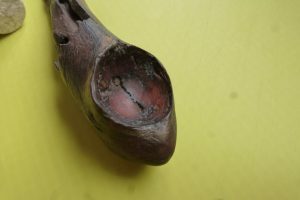 The bowl features colour from the heart wood and several dark patches for added interest. 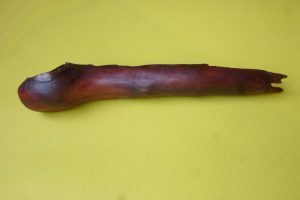 Overall length 30cm (11 3/4″) and bowl 8,5x6cm. Finished with food-safe natural linseed oil. Price $50 including post Australia-wide. Overseas buyers please contact me. 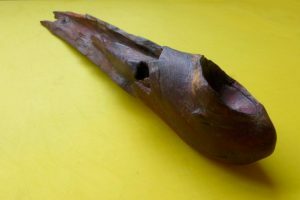 It is not common that I carve Eucalyptus – it is a difficult timber in many ways. However, I did throw caution to the wind and lugged home a few bits from a tree that snapped in half in a storm. One of the benefits is its durability – there are instances of the timber used outside over 100 years ago and the timber, while weather generally maintains its integrity. 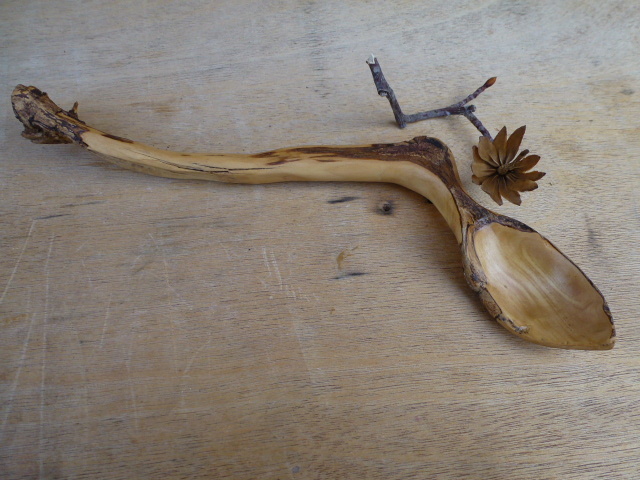 What better for a spoon to last a lifetime, or more…. Another benefit that is also shown in this item is the wonder rich grain and deep colour of the wood. 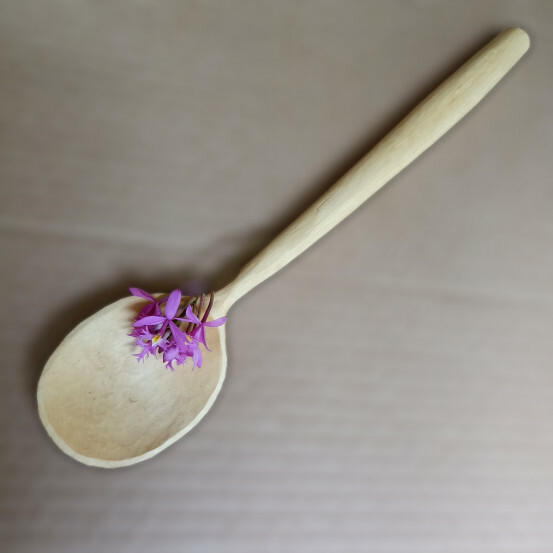 The spoon is a generous 310mm in length with an 80x45mm bowl backed by a gentle curve leading to the resat of the handle. 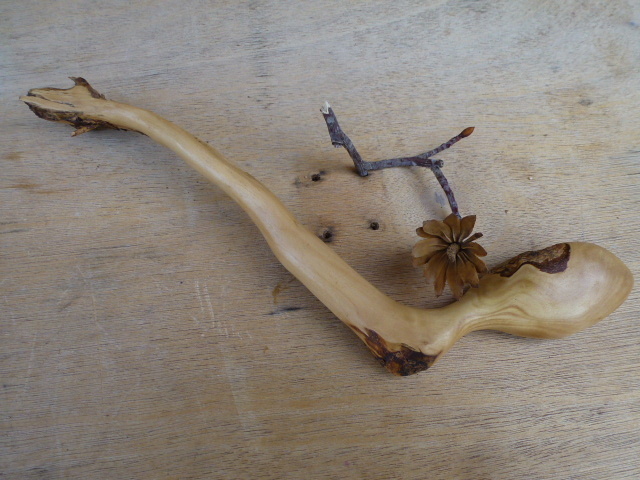 As is normal with many eucalyptus, there is a resin feature on the handle. Price $40. Overseas buyers please contact me. Local Toowoomba, Qld pickup by arrangement. 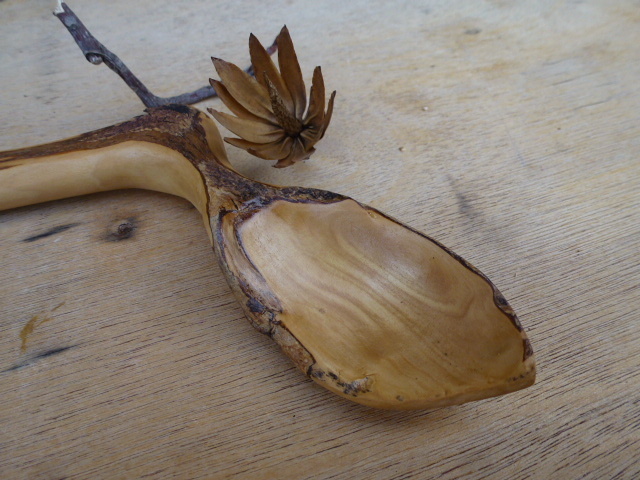 Spoon carving workshops are increasing in popularity. Many people who may not want to do a workshop themselves o me they know someone who would. 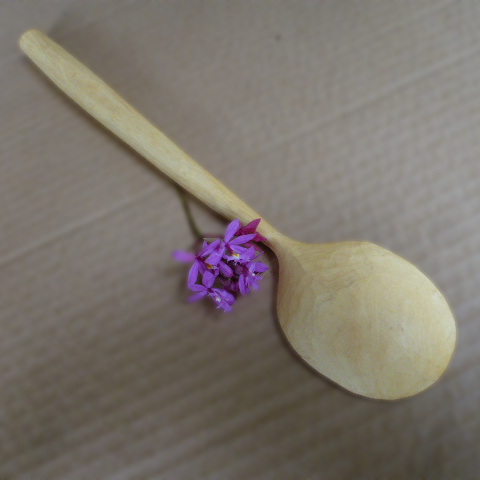 What better gift than a voucher for a traditional wood spoon carving workshop! Now you can gift the gift of a workshop by purchasing a voucher. These cover the cost of a workshop in Toowoomba. The recipient will be able to select one of the upcoming workshop dates (updated every month) and choose one to suit their timetable. This funky spoon us perfect for cooking and serving. 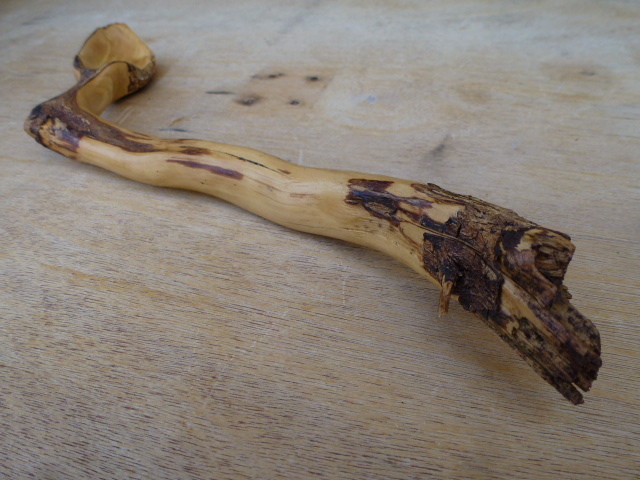 It features wonderful colours and the knot in the handle is a very attractive feature. Price $55 including postage Australia-wide. Local Toowoomba pickup by arrangement. Overseas buyers please contact me. 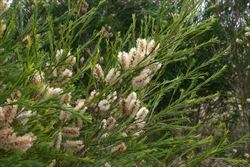 The Leichhardt Bean tree is found in Nth NSW and Sth Qld. 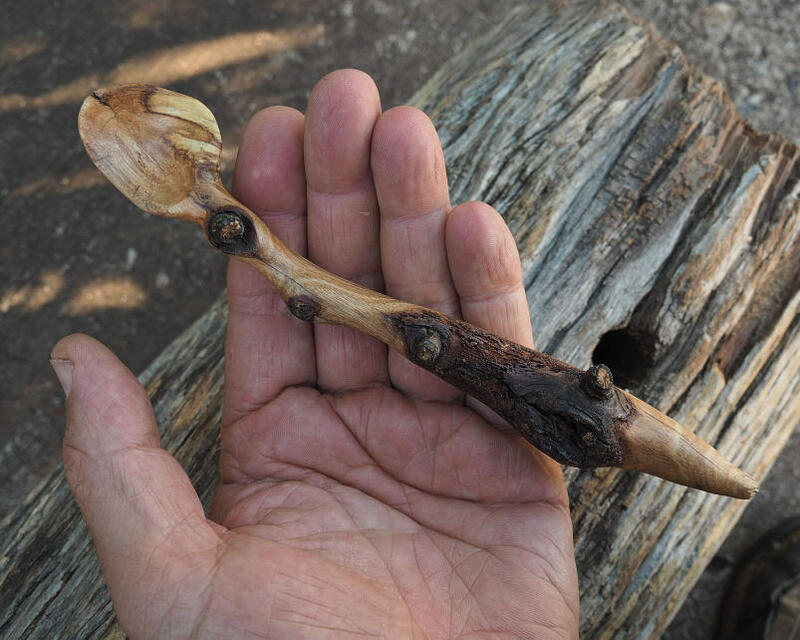 This spoon was fashioned from the root of a tree that was removed to prevent further damage to a path. While the root was green it held little promoise but on drying was pleasant to work into the decorative spoon that elements of bark and signs of its removal from the ground. 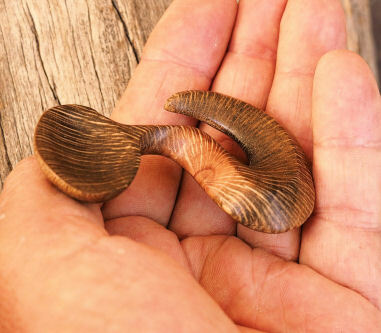 The bowl demonstrates some attractive grain patterns. 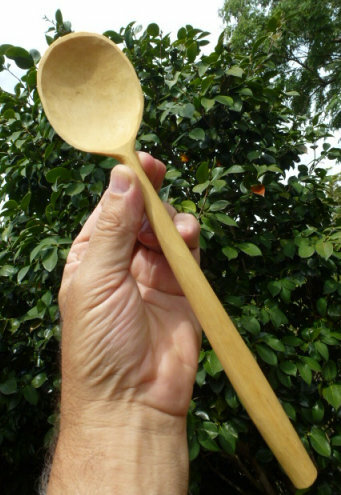 This attractive spoon is handmade from from rare black Macadamia wood. 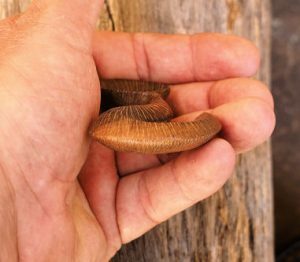 (The same species as the nuts come from). The price reflects the extreme rareness of this colouration and the delicate work require in its creation. This spoon features a serpentine handle featuring amazing grain pattern medullary rays radiating out , rounded bowl that continues the radiating medullary ray spread throughout the piece. Price $75 including shipping Australia-wide . 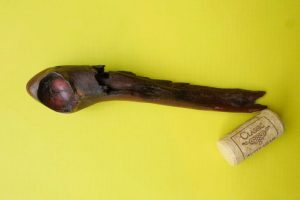 This ancient Eucalyptus stick spoon is a perfect item for the collector of the unusual/ novel collectibles. Crafted from an ancient branch, t features a hollowed out knot hole, a heavily eroded side and a side that shows glorious deep red colours in sunlight. The item has been finished with several coats of special vegetable gum sealer that gives the item a natural sheen. It is 165mm in length. Price $85 including shipping Australia-wide. Enjoy the natural transition from stick to sleek white bowl that feature delicate grain patterns. 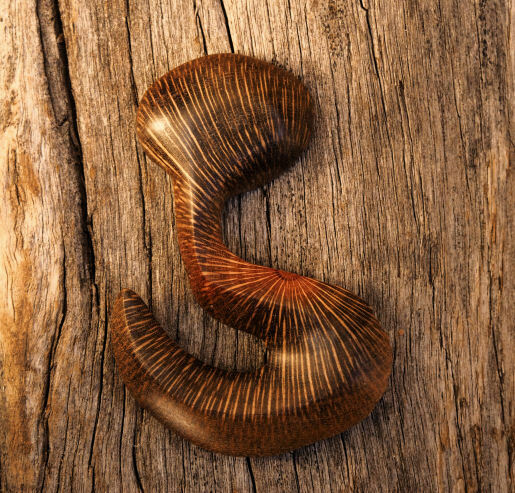 Crafted from locally source white acacia it is a one-off as dictated by nature. Price $40 including shipping Australia-wide . 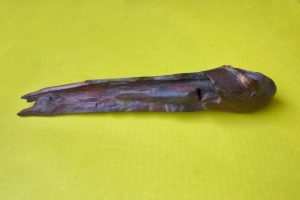 This quirky Eucalyptus stick spoon is a perfect item for the collector of the unusual/ novel collectibles.